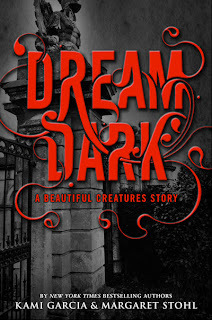 The Compulsive Reader: Dream Dark Out Today! Wounded during a climactic battle, Link discovers that tending his injuries won't be as simple as visiting a doctor and that healing his arm should be the least of his worries. For being bitten by a Supernatural does more than break the skin -- it changes a person, inside and out, turning Link into someone more and more like the dark creature who injured him." PLUS, it includes the first five chapters of Beautiful Chaos! So, it's totally worth $1.99, in my opinion! And, it's available starting today! Yay! yay! Glad I brought my Kindle to work! Thank you for that update! I just downloaded it-- it's so amazing so far, I'm practically inhaling it! I will have to get this. I didn't know about it and I'm a fan of the series. Thanks for sharing! is it bad to say that i still haven't read Beautiful Creatures even though i own it? I think it might be time to pick it up. *Sigh* Goodies like these make me wish I had access to a Kindle...but I still prefer having physical copies to read, and reading them for free through the library. How do costs average out for you? Lauren: I prefer physical books as well, but I LOVE my Kindle. You can get one as cheap as $114, and I predict the prices are going to continue to drop, especially around Christmas. I rarely buy Kindle books for full price...if I can get a physical copy for a few dollars more, it's not worth it, and no e-book is worth more than $10. There are a TON of deals for YA and adult books under $5, and there is a lot of decent free material out there. If you are interested in still enjoying the fun short story things like these, something to keep in mind is that you can download the free Kindle app to almost any device, and then read on there. Anything you purchase or download will be saved to your Amazon account, so if later on you do purchase a Kindle, you can put them on there. Same thing with iPad. Amazon also has a new feature where you can read things in the Cloud. It is a pretty cool thing, and some of the short stories that come out that are companions to popular series are definitely worth it! Hmm, I didn't know about the free app. That's definitely something to check out. Thanks!